The ermine is found all over Canada, northern USA, and Eurasia. 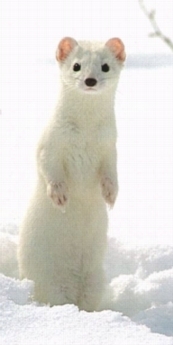 The Ermine lives in northern biomes such as taigas and tundras. The Siberian tundra is a vast land that is almost completely dark during the winter season because of its far north location. Also, the climate in winter is extremely cold. In fact, the Siberian Tundra is the coldest biome in the world. In the summer the Siberian tundra has many bogs and puddles scattered around the land because permafrost won't let the winter snow drain off. It is during the summer that most of the animals come out. Although the climate remains fairly cold, the Siberian Tundra is bright with sunshine. 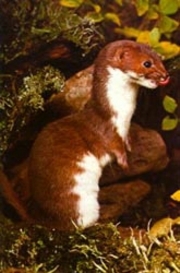 Ermines like to inhabit marshes, open spaces or rocky areas next to woodlands. The ermine is well adapted to living in this harsh environment. They make their dens in the old roots of a tree or in the crevice of a rock. Ermines are capable of having several dens. Ermines may make their dens in the roots of trees farther south, but there are no trees on the tundra. The ermine is a small animal that weighs between 3 - 15 ounces. The head and body length can range from 7 - 13 inches and the tail can grow up to 5 inches. The males are much longer than the females. In the spring and summer the ermine's coat is chocolate brown with a white underbelly and a black tip on the tail. In the winter the coat turns entirely white except for the black end of its tail. The ermine's flexible spine allows it to do the "marten run" in which the hind feet are tucked in by the front feet, causing the back to arch, and then extended. Since the ermine is a carnivore, it has 34 sharp teeth. It has short legs and a long body and neck. The head is triangular shaped with small round ears, small, bright eyes and long whiskers. The male ermine reaches maturity at 12 months. The female reaches maturity at 2 months of age. The mating season is during late spring and summer. They have babies every year. Three to thirteen young are born each mating season. The birth size of the ermine is a half an ounce. When the kits [babies] are 8 weeks old their mother teaches them to how to hunt. After the mother teaches them how to hunt the female kits [babies] are ready to mate. The males aren't ready to mate and leave their mothers the next spring. The females might stay under their mother's protection in her territory. Ermines are very territorial. The female ermine has the sole responsibility of raising the young. The males do not usually help raise the young. An Ermine's life span is 4 to 7 years. Aside from raising young, the ermine is a solitary animal. hunt entirely under the snow for small rodents. Their ermine paws have claws which enables it to dig. The front feet are smaller than the back which helps it fit into small, tight spaces. The coat of the ermine changes with the seasons and camouflages it from predators. In winter the ermine's coat is white blending in with the snowy environment. In warmer seasons the fur turns brown again matching the color of the landscape. In its Siberian tundra habitat ermines prey on a range of small animals and birds. In a different environment ermines are know to sneak into barns for a meal of chicken eggs. They are very adaptable in their diet depending on where they live. In their Siberian environment the ermine is prey to snowy owls, arctic foxes, lynx, gyrfalcons, hawks and other large mammals and birds of prey. When it starts to get colder in Autumn the ermine sheds its brown coat it wore in spring and summer, and grows a new white coat for winter camouflage. A long time ago during the Middle Ages the fur of the white phase of the Ermine was popular in clothing. Now ermines are almost never used in clothing. Ermines are neither threatened or endangered. Kaplan, E. (1996) Tundra. Tarrytown,NY: Marshall Cavendish Corporation. Tanner, O. (1976) Bears and Other Carnivores. Massachusetts: Vineyard Books Inc. "Ermine. ", Wildlife Explorer (1997) USA: International Masters Publishers.